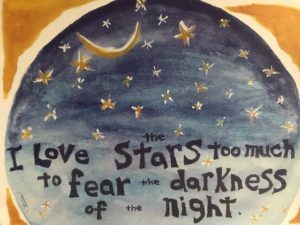 This watercolor painting of a starlit sky hangs on a wall in my daughter Lila’s room. She carried it home from a third grade field trip to Viva House, and it quickly became a favorite piece of art in our home. In her watercolor Willa captures what we all too easily forget: Darkness is the birthplace of light. Nighttime is womb-time. Fear not. The word “womb” in Arabic and in Hebrew, “raham” and “rachamim” respectively, also means “compassion”. This dual meaning invites us to consider that compassion is our first and most natural home, our womb. It invites us to recognize that practicing compassion for ourselves and others nourishes our soul and guides us home. Perhaps feeling into the compassion of the enfolding dark, and remembering that compassion is our natural state, is a practice that can support us this Advent. It may be as easy as bringing more awareness to just how good it feels to snuggle into our warm beds at night. In Advent we are invited to journey in and through the darkness. Darkness invites us to slow down, turn inward and rest deeply. In a culture that leaves little time for rest, the Advent Retreat being offered here at Redeemer on December 8th — “Dark Enfolding, Light Emerging, Hearts Full” — is an opportunity to experience Advent as womb-time. A variety of opportunities to slow down, turn inward and rest deeply will be offered, including guided meditation, painting, journaling, centering prayer, chair yoga (gentle yoga while seated in a chair) and restorative yoga (practicing stillness or gentle movement for extended periods of time to align and center our breath and body). Our lunch hour will feature guest speaker Bill Kiley, a retired police officer who will talk about his journeying in and through the darkness of racial strife towards the light of racial reconciliation. We will conclude our retreat together with a simple Eucharist. There are a variety of “points of entry” so if you can’t participate for the full retreat, you can at least participate for some. Click here for the day’s schedule. This Advent may we slow down in order to feel nighttime’s sweet embrace. May we abide in the compassionate darkness where creativity, aliveness and energy are born. May darkness grant us permission to practice self-compassion so we may find new life from peace within and share this with others around us. Editor’s Note: Vivian is our interim director of youth ministry and is also a professional yoga instructor. Please let us know you are coming! RSVP to Cristina. Why do we do the things we do? Every family has traditions for the holidays… You use grandma’s china or a special table cloth, you sit in the dining room for a change instead of crowding into the kitchen, you roast a great big turkey in place of more typical fare, like meatloaf or chicken or pork chops. Did it ever occur to you to roast a turkey at any time of year other than Thanksgiving or Christmas? Isn’t that kind of odd? Ambrose Bierce wrote in The Devil’s Dictionary, “Turkey: A large bird whose flesh, when eaten on certain religious anniversaries has the peculiar property of attesting piety and gratitude.” My father saw it as some kind of penance for his sins. He didn’t like turkey very much, so there was always a bit of complaining that circled around our holiday table, especially while he was carving. “I am only going to eat this, because your momma says it is good for me,” he would say, usually when the white meat began to crumble or a drumstick fell onto the table. Now a man of some experience with marriage would have had more sense than to ask such a question, especially on Thanksgiving eve, of a young, inexperienced cook who has been on her feet all day. As soon as he said the words and saw the look on his bride’s face, he wanted to take them back, but he couldn’t. She answered, “My mom always did that to help the turkey thaw,” and the groom left well enough alone. The next day the woman’s mother called to see how everything was going. “Fine, Ma. I have everything ready to go into the oven. I even remembered to put the dish drainer over the turkey last night.” This seemed to confuse her mother a bit. “What are you talking about?” she asked. “Oh remember, you always put the dish drainer over the turkey when it is thawing in the sink,” the daughter replied. “You said it helped.” There was a pause on the end of the line. “Yes honey, but we had cats.” Old habits die hard. Sometimes families nurture practices whose meaning has been lost or become tenuous. Many of us are still reeling from the horror of last weekend, when a man opened fire at a Pittsburgh synagogue, yelling “All Jews must die!” and killing 11 people. That the victims had entered a sacred space and gathered for Sabbath prayers makes it especially heinous. “They were vulnerable with their guards down, like us,” a teenager said to me on Sunday. “Are we safe?” a grandmother I hadn’t met before asked on Monday evening, at an interfaith response to Bernstein’s Mass. I paused before I answered, trying to hear clearly what lay beneath her words. “We’re always better off together than we are alone,” I offered, and her face softened. “That’s why I came,” she said. We are called to heal the world, to repair with God’s help the brokenness we encounter around us and inside us, to stand with those who struggle, and to comfort those who weep. It can feel overwhelming—if you love deeply, you grieve deeply–but our hearts won’t let us ignore it. We are better off together than we are alone. I have been asked to give the closing prayer at a Shabbat service of solidarity this Friday at Baltimore Hebrew Congregation, to which Redeemer is heartily invited. (https://www.baltimorehebrew.org/praying/services/) Join me if you can.